Facebook advertising changed A LOT in the last 6 months. Listen to find out why these changes occurred and how you can succeed with Facebook advertising in 2019. In this episode, Ezra Firestone and Molly talk about how to appeal to Facebook’s algorithm by generating a ton of SOCIAL PROOF. They walk us through campaigns they’ve run this year and why they worked. One of Ezra’s campaigns spent $350k in just the first few weeks of the year! Thanks for joining us this week. Want to subscribe to The Perpetual Traffic Podcast? Connect with us on iTunes and leave us a review. iTunes not your thing? Find us on Spotify, Stitcher, or TuneIn. Molly Pittman: Hey, Perpetual Traffic listeners, I would love to invite you to join Train My Traffic Person, which is a 14 week mentorship that I am holding starting January 30th. This is for media buyers. Really, no matter your skill level, the beauty of this is that you get direct access to me during this mentorship process, so that you can have ad copy critiqued, ad creative critiqued, so that when you get stuck, you have someone to talk to. By the time you’re listening to this, we’ve actually closed the doors on Train My Traffic Person. Molly Pittman: But I knew that there would be Perpetual Traffic listeners out there that would want access to this and that would want to sign up. We are accepting a few more Perpetual Traffic listeners at smartmarketer.com/pt. Check that out for more information. If you’re interested, sign up as soon as you can because we will be closing the doors on those soon. I’m really excited to lead this mentorship for a second time, and I can’t wait to see you guys inside. Darren Clark: You’re listening to Perpetual Traffic. Molly Pittman: Hello everybody. Molly Pittman here, and I would like to welcome you to episode 186 of Perpetual Traffic. 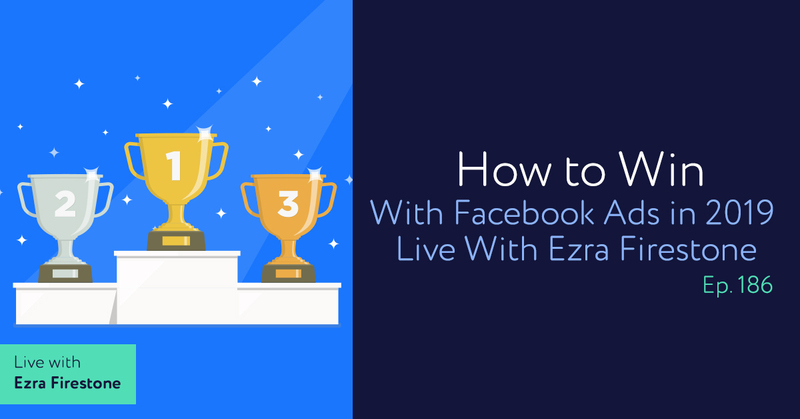 This is going to be a really fun episode because in this episode, Ezra Firestone and I are talking about how to succeed with Facebook Ads in 2019. We’re going to share some campaigns that have been working really well for us so far this year. Now, this is a recording of a Facebook Live that we did last week, but I thought you guys would find this information really, really helpful. If you would like to watch the video version of this, please visit digitalmarketer.com/podcast and visit the show notes for that recording. Molly Pittman: Today we just want to update you guys, give you a little bit of content, show you some examples of some things we’ve been doing, and especially doing in preparation for this year. Something that Ezra and I have both figured out, and I think most Facebook advertisers have, is that a lot of stuff changed on Facebook last year. Things are always changing, but not the shifts that we saw last year. A lot of that was because of the whole Cambridge Analytica data breach, and Facebook was really in the spotlight from the general public. There was a lot of scrutiny. There was almost a lack of trust from the public towards Facebook. And so they realized that they have to make changes way more than just releasing new features for us advertisers. Molly Pittman: They need to change their model in a way. What we’ve seen across the board is that things are definitely changing, and the reason for that is that Facebook’s algorithm is now very much optimizing towards social proof and the experience of the end user because they realized that if the end user doesn’t like the ads they’re seeing, they’re probably going to spend less time on Facebook. What we’ve seen is that strategies that used to work in the past, like super direct response stuff, it’s really hard to find success with that nowadays. We just wanted to show you guys some examples of what is working right now, and just some of the changes that we’ve seen and what that means for you guys. Is that what you were thinking Ez? Ezra Firestone: I want to comment real quick on anytime … you and I’ve been in this game a long time. I’ve been running ads online since ’05. Ezra Firestone: It was Google AdWords, it was Pinterest and Facebook, [inaudible 00:03:58] whatever. But every time there’s a major change, people freak out. But actually, it’s an opportunity because the reason that Facebook is changing is so that they can serve their customers, i.e. every person who’s not running ads. Ezra Firestone: And so it’s better for us actually as marketers to have folks who are engaging with Facebook, regular folks who are not marketers, happier with the platform and are happier with the ads that they’re seeing, and having their feedback about ads incorporated into the Ad Algorithm, which is … the simple way of saying this is story, content, simple, real, social proof, engagement, all this stuff we’re going to be talking about. It’s real connections with real people about stuff they actually care about and it’s not old school buy my [inaudible 00:04:45]. Molly Pittman: Totally. We’ve seen this change happen over the last five to seven years, but now it’s like no longer an option. Really the two big changes. The first one we talked about is social proof and being personal, everything that Ezra just said. A few years ago, Facebook rolled out a relevance score, which is a score from one to 10 that basically tells you how well your ad is relating to the audience. How are they responding? Do they like this ad? Are they having a good experience? And now that is more important than ever. And really, the metrics that Facebook has to judge, to come up with that relevance score, mostly comes back to social proof. People sharing your ad, people reacting to your ad, people commenting on your ad. That’s more important than it ever has been in the past. Molly Pittman: And the other thing too, the second point we really want to make is that Facebook has gotten a lot smarter over the last year or two, probably exponentially smarter than I’ve ever seen the algorithm develop. But they’ve gotten smarter, so that has really changed our strategy around things like audience sizes. You guys will hear Ezra and I talk about this more in a few weeks, but I dove into his ad account for Boom, and Ezra had all this really advanced targeting set. Ezra Firestone: I was very proud of this by the way. Molly Pittman: Very proud. And it was awesome. But the problem was that your audiences were so small, Facebook was really having trouble optimizing your ads. Especially because you were mostly optimizing for conversions. So then we broadened those audiences out, and you started to get more traction and a lot more volume. Right? Molly Pittman: What’s interesting is two years ago, I remember Ezra you and I recorded a video about targeting for one of your trainings. I’ve always taught targeting to be very, very specific. I still think you have to be specific in your targeting research and understanding your market, but if you’re launching an ad set that has 50,000 people in it and you’re not a local business, Facebook’s going to have trouble with that because they just don’t know what to do with such a small audience size. So now, some of my ad sets have 30 million people in them. Two or three years ago, I would’ve been like, “No, don’t do it.” Because Facebook wasn’t as smart then. They needed you to tell them exactly who to show the ad to. Molly Pittman: I think it’s really two things. It’s number one, everything is about social proof, and I’m about to show you an example of that. And not just social proof, but what you talked about as being personal. It’s more important now than ever for your ads to really look and feel like a native post. If you guys go to my Facebook page, I posted a few days ago a screenshot of someone who saw one of Ezra and I’s ads and I’ll show it to you here in a minute, but it was a story. We just told a story in this ad, and the person commented that they saw the post, they read the story, they were really compelled, and they were feeling guilty because they were like, “I don’t remember meeting Molly. I don’t know when we became Facebook friends. How do I not remember this person?” And then he realized this is an ad. Even if you’re a brand and not a personal or a public figure, this is so, so important. Molly Pittman: This is a campaign that I recently ran. This was for a docu-series about the ketogenic diet. Really good time of year to run ads for this type of offer, just because people are looking to get in shape and get healthy. But the way that I ran this campaign will show you what we mean by the two points that I just made. But the first thing I want you guys to notice and why I think this works so well, was back to using larger audience sizes, especially after you have some data on your pixel. After Facebook really has a good idea of who this person is that’s taking this action. You can see that we’re getting people to opt in here. We just set up a custom conversion on the landing page. Molly Pittman: You’ll see that I have seven ad sets here. These are also called traffic. And this time last year, I probably would have had 50 ad sets because I was trying to make the audience sizes small, make the audience is very specific. But these are much bigger because Facebook has gotten smarter, and the bigger audiences are actually allowing me to scale at a very quick rate. Those 50,000 leads that I told you about were generated in just 12 days. Before last year, using older strategies, it probably would have taken me twice as long. This first ad set, this has 35 million people in it. Molly Pittman: And I’m just using interest targeting here, which is something I love to teach and talk about. We go really in depth inside of Train My Traffic Person. There were a few people who just through doing the targeting exercises that I taught in the course were able to cut their CPA in half, just from better targeting. Better targeting is everything. But you’ll see since this is the keto diet, I’m targeting Atkins diet, different interests around the keto diet, apps that they’re using, ketone bodies. This is all about ketosis and the Atkins diet. Molly Pittman: You can see that this other ad set here, this one’s a little bit over 5 million. It’s smaller, but it’s still bigger than I would have used before. This one, this is interest all around GMO’s. What I found is that people that are really against GMO’s, they’re interested in the keto diet. This one performed really well, but I definitely had to spend a lot of time on interest research to find some of these interests. These didn’t just come off the top of my head. Molly Pittman: Back to the idea of social proof. Before, we might’ve tested 10 different ads in each ad set. I even see people test 50, 60, 70 ads in an ad set. That can be okay when you’re testing, but when you’re wanting to scale like I did here, the more ads that you produce, the more that you’re distributing your social proof across different post ID’s, which is not good for you. That’s not what you want to do. You want to keep that relevant score high, you want to try to aggregate as much social proof as possible. Inside of each ad sets I have the same two ads. Only two ads. Ezra Firestone: …. the shared to reaction ratio and ways that people can encourage shares, comments, likes? Molly Pittman: Totally. The share to reaction ratio is something that Facebook’s looking at to look at the strength of the social proof. If it’s 20, 30, 40, 50 percent, that is really, really good. What I mean by that is the amount of shares compared to the amount of reactions. 11 divided by 21, rough math, that’s about 50 percent ratio. This is something that Facebook’s definitely looking. And also comments, but more so, shared to reaction. And so you don’t want to ask people directly to share your material or to share your ad in the ad because it takes away from your CTA, and it’s against terms of service. But if you use an ad that feels very native … so it either feels like a personal story that could help someone else. Molly Pittman: For example here, this is almost a four minute video that’s a trailer for this film. There is content in this video. You could get value just from watching this video. The author’s great, it’s a free viewing, we’re not asking them to buy anything. This is very shareable. Ezra Firestone: The goal is engagement, sharing and also having people consume so that they’re willing to take the next step, which is clicking the ad and going off to the landing page. If you’re going to be an advertiser in 2019 and you want to get results, you have to get this. That old school, super loud, aggressive ads are not going to get reach. They’re not even going to get served. The goal now is reach optimization. What I mean by that is you want to set your ads up from the beginning, so that Facebook will show them to people. Molly tore down my ads a bit. She tore my ads campaign apart. Ezra Firestone: We spend millions and millions of dollars a year on some ads. We do a really good job, but we were actually sabotaging ourselves in terms of not even being able to get reach, which molly will explain now here in a minute. Molly Pittman: This is another really awesome example of this. I’m not quite sure about the … it looks like a game of clue for adults. What you can see already is the social proof is great. The shares could be higher, but dang, there are a lot of comments here. There are more comments than there are reactions. They’ve used this very personal photo. I sent this to John Grimshaw earlier Ez, and he said, “Wow, I thought for a second that was some of my friends. That’s a photo that I would scroll through my newsfeed and think that a friend posted this.” It’s not super salesy, it’s not a product image of this game and all the pieces and cards that come with it. It’s just two people that catch your attention. It looks very native. Molly Pittman: This ad copy is pretty native too. It’s not too salesy. They’re getting a ton of social proof, and that’s why this is working. Another example, so I’ll show you guys this other ad that we ran. It was very simple, just testing a bit of different copy and a different video variation. But again, this works so well. Look, 8,200 shares, 13,000 reactions, almost 3,000 comments. This was really easy to have success with because as soon as we launched the campaign … these were ads that I ran last year. I just grabbed those post ID’s as you can see right here, and used the same ads that I was using last year. And they came out of the gate. Molly Pittman: It’s January, ad traffic is as cheap as it’s going to be all year. Facebook is really optimizing for social proof. I gave them some big yet very targeted audiences to play with, and this was a dream campaign because it came right out of the gate just hot. Because it already had about half of the social proof that you see here from last year, so Facebook was like, “Wow, people must love this. The targeting was good. They had enough room to breathe. This was a huge success.” Another example, these are the ads that Ez and I ran to the webinar that we did last week. Molly Pittman: We hadn’t done that before, so we didn’t have ads that already had social proof on them. And so we didn’t have social proof to leverage. What we did, we used the same strategy, but we had four ad sets, but they were pretty big. Pretty big audience sizes. And then within each of these, again, just two ads. What you’ll notice is how personal these ads are. I heard of people see the two ads that I’m about to show you, and again, think that they were personal posts. This was a picture we took last month. We never meant to use it in an ad, but it was great. You’re close up. Whenever you see humans this close up to the camera, it’s very natural to stop. Molly Pittman: But again, it looks super personal. It looks very native. And I’m telling a story about the campaign that I just told you guys about, and that we were hosting a training and that we wanted to teach you guys what we had learned. Again, social proof really matters. This one didn’t get as much as the other one, but we got a lot of comments. Shares could have been higher, but all around pretty good metrics here. And then the other one is even more story based, and again, a very native photo that we … Colleen took this last year. Never meant to have been an ad. Ezra Firestone: Came up in the game. Ezra Firestone: … to generate … let’s see. 8,700 purchases at 41 bucks a pop, which is really, really good for us. We’re happy with that. But we had been running to everyone in America who was a woman, was over 45, no targeting. And Molly said, “Hey, maybe you want to actually introduce some targeting groups here.” I’m want Molly to explain … I’d love for you Molly, if you could explain why you asked us to introduce targeting groups. Molly Pittman: Of course. What’s interesting, both launches that I just showed you, both campaigns I just showed you had an ad set in it that had no targeting because booth pixels were seasoned and that could work. But what’s interesting is that people think when they reach the point of, “I can use no targeting”, that that’s the only targeting that they should use because “We’re targeting all of America.” But the issue is that with that is that you’re actually only reaching a small part of your market when you do that. Because when you use no targeting and use then conversion objective like you are, Ezra, Facebook’s looking at everyone who has engaged with that objective before, everyone who’s purchased from Boom in the past, and they’re creating a data profile off of, what does that person look like? Okay, now let’s go out and find more of these people. That’s why the no targeting can work. Molly Pittman: But like I said, yes, you’ll be able to reach those people, but you’re missing out on a huge part of your market of people that just don’t fit that data profile that Facebook’s looking for. And so I’m saying you need to do it all. No targeting, lookalikes like you see Ezra using, they’re becoming more powerful than they were last year, and interest targeting like you guys saw me using in the keto docu-series launch. Something that Ezra and I are going to be working on in the next few weeks is getting some interest targeting for Boom. Because I imagine the ad sets he has right now are just lookalikes. Molly Pittman: So we add the no targeting back and its own ad set, and then we add five to 10 ad sets with some big interest targeting. And Ezra, this is even more scalable than before. Right? Molly Pittman: Last year, you guys were getting similar CPA’s, but your volume was so much lower because you were only limited to the people that matched up to that data profile from people who had purchased. Now by adding all of this other targeting, it’s just allowing you to scale in a much bigger way. Ezra Firestone: Yeah. We had limited our ability to reach people in our audience. We thought we were reaching … we thought, “Hey Facebook, give us everyone in America.” But since we were optimizing for a purchase on our Facebook pixel, Facebook was only giving us people they thought would purchase, and we were missing out on a whole bunch of other people. Now I want to add a counterpoint. Molly was talking about super personal, super nonprofessional imagery, which is great. Ezra Firestone: However, if you have compelling imagery that resonates with your target market, that has them feel good and represents them, that can also work. I want to explain to you the concept of a super lookalike. You’ll notice the names here on these targetings is one percent super, two percent super, and we’re still running to women over 45 in the United States. Let me explain to you what a super lookalike is and then I’ll show you the ads. Ezra Firestone: A super lookalike is … real quick for those of you that don’t know what to lookalike is, a lookalike is where you upload your customer list and you say, “Hey Facebook, give me a group of people who look similar to this group of people.” You upload your email list or you do it with your Facebook fan page. You say, “All my fans or anyone who’s ever watched a video…” You can create what’s called a lookalike audience based on any data point that Facebook has. People who viewed your videos, people who are fans of you. A super lookalike is a one percent lookalike, so it’s giving you the top one percent of people who look like fans, buyers, subscribers, whatever, and all in one ad set. Ezra Firestone: For those of you that maybe are not in the cosmetic space, there’s this debate about eyeshadow and whether you should use it if you’re over 50. We have at our brand, some opinions on that, and so we shared those. And that’s very controversial. All these comments are like, “What do you mean ditch the eyeshadow?” People are in uproar about that. Molly Pittman: Ez, really quick too, the reason this works so well is that you’re giving really good content. Like I said, you either need to give content … that’s more of what the keto docu-series was. It wasn’t from Naomi like, “I built this docu-series because this is my mission.” I went more the content route with that, and people are seeing, “Oh he’s giving me five makeup tips? And it’s a little controversial, so people want to comment? Holy crap!” Now you’ve got all of this social proof, and it’s keeping your relevance score is high. Ezra Firestone: This ad worked extremely well. We have a really beautiful, nice headshot that is representative of the women that we’re targeting. You’ll notice that in our ads, we use people’s faces that represent the people that we’re attempting to target. We find that there’s nothing more compelling than a person’s face it seems. It’s nice to look at people’s faces. And Molly, it’s funny. Our ads also had people’s faces in them. Ezra Firestone: They are using professional imagery, we’re doing high quality design on them. We found text layovers and colored backdrops with a person’s face as you just saw, to work extremely well. Now we have conversational ad copy. We link to content. We’re not just trying to sell when we’re getting people’s attention. Now if they’ve seen our products, we’re going to run ads that are about our products. Molly Pittman: Ezra, and that’s such a good point too, especially when it comes to this social proof storytelling, content giving strategy we’re talking about, that is the most important at the top of the funnel. Especially to cold audiences. You’re retargeting ads, the relevance scores still matter, but it’s a bit of a different game when you get deeper in the funnel. Molly Pittman: It matters most on the front end when you’re wanting to get all of this for reach. Ezra, you said you spent like $300,000. I can’t see your screen, but I think that’s what you said, on that campaign. Molly Pittman: I don’t think after doing our review you spent that much in any month last year. Possibly. Definitely not on one campaign or one ad like that. Ezra Firestone: Definitely not on one campaign. Molly Pittman: We talked about this in December. Ezra and his team deployed it, and then I saw you last week and you were like, “Yo, I’ve never seen something scale like this.” I really think it was just those few tweaks. Ezra Firestone: Yeah, for sure. 100 percent opening up that audience funnel. A good portion of my audience is ecommerce business owners, because that’s my business model and that’s what I talk about and it’s what I share. And so I have been very anti doing email lead generation as a front end acquisition model for an ecommerce business. Not anti in terms of not having seen that work, because some people do it in the works, but anti in terms of my goal is always to set up a sales process that is story based ad, content consumption to sale. Ezra Firestone: While they’re in my sales process, if they visit my a presale article or if they visit my sales page, sure I have the opportunity to collect an email. I have exit intent, I have cart abandonment, I have email in the process, but I’m not leading with, “Give me your email address and let me follow up with you”, because I’m only selling a $50 product or a $100 product whereas with a more expensive item, you need a longer sales cycle so you lead with the email, you build the relationship and then you offer a sale. Ezra Firestone: I have changed that view, and now I hold the viewpoint and I’m going to show you this, that it is beneficial. After I looked at my metrics over the last five years, I can tell you there is no more profitable source of visibility than people who are on my email list. Because people will get on my email list, I send them content, and then occasionally I say, “Hey, I have a product you might like.” And so I’ve started running some lead generation campaigns. And the first one is a giveaway, and I want to show it to you real quick. Ezra Firestone: If you’re a woman over 50 on Facebook, you’ve seen my ads like seven times. I’ve reached every woman in America and Canada over the last five years. I’ve spent like $15 million dollars on advertising for this brand, and they all know who we are. They may have not bought from us yet, so we have this giveaway campaign here. Now this is saying, “Hey, you get a free … you can get enter your email address to get a free Boomstick. This week, we’re giving one away. Just enter your email address.” Headline shows off our product. Nice blue background. You’ll notice we’re big fans of colored background. Ezra Firestone: We tell them there’s four ways to win, and no way to lose. And then you’ll notice that real quick, it’s got good comments, it’s got … what is that? A 25 percent engagement to share ratio? Ezra Firestone: The point that I wanted to make is two things. Once you actually enter your email address, we put you on an automation flow, and I’m going to show you that real quick, and that automation sends you an email and this is what that email looks like. It just says, “Hey, outstanding, you’re in. We’re going to let you know if you win, and you can go over and check out the offer while you’re waiting to find out if you win.” Now I want to show you something interesting. Big shout out to an error my social media manager made. Ezra Firestone: My social media manager, Laura, who you’ll meet on the Smart Marketer blog, made a mistake, and it turned out to be a real good one. I told Laura … I’m not trying to call her out or shame her or anything, in email marketing, if you don’t send the wrong email to everyone at least once, you’re not doing email marketing. How many times have I sent Smart Marketer emails to Boom. Molly Pittman: Ezra messaged me a few days ago. I had the wrong URL linked up to an ad. Molly Pittman: It happens to all of us. Ezra Firestone: It happens. But let me show something. If I look at the analytics, why are there $500 in sales on this email? It doesn’t make any sense. It’s not a sales email. You just entered a giveaway. Well, it turns out that the mobile version here, this mobile version … so Klaviyo, what we use, has a different editor for the mobile version of the email, and so Laura had accidentally left the mobile version from the old campaign because we duplicate campaigns, and the mobile version was from a previous giveaway. So after the giveaways, everyone who doesn’t win we say, “Hey, you didn’t win, but here’s 10 percent off”, and we make a bunch of revenue from the people who didn’t win. And then everyone goes on our email list and we send them content and now they’re a part of our database. Molly Pittman: You’re generating these leads and you have a way to monetize them. You know because you have such a strong email strategy, that you are going to monetize those leads. But it’s cool to see a simple giveaway have such a return immediately. Ezra Firestone: I’m all for email marketing. You’ll see a lot more email lead gen campaigns from us coming up. Ezra Firestone: And the email list is in every business model, the most valuable asset. Molly Pittman: Absolutely. I think that this just works because number one, this comes from a place of, we really want to help you guys. And when you sit down and you go to that place of, how can I best help the end user? I promise you your copy will be much better. That’s just a fact. But also if you can think about, how do I turn this into a story, even if I’m just asking them to download a pdf? There can always be a story, no matter whether it’s coming from a public figure or a brand. Molly Pittman: We’ve talked about this a little bit at the beginning of the video, but Ezra and I are about to teach another class of Train My Traffic Person. We held our first class at the end of last year. Yeah, it was probably one of the best experiences I’ve had in my career. So fun because it’s a mentorship. Like you said earlier, Ezra, you join the class, you fill out an intake form so that I can get to know you, your business, what you’re really wanting out of the course. And then this course is taught live. It’s not just videos that are being repurposed. Molly Pittman: This course is taught live and really crafted around the needs of students. We added a payment plan, a three-pay payment plan to make it easier for you guys, and we will be accepting students up until the end of day Monday, unless we get to a point where we feel like the class is too big to serve everybody. But head over to smartmarketer.com/molly. I would love to have you guys. It’s a really fun course. Mentorship class. Experience. Molly Pittman: Hey guys, I hope you’ve enjoyed this episode as much as I have. It was such a blast to record. To check out the full video, go to digitalmarketer.com/podcast. Darren Clark: You’ve been listening to Perpetual Traffic. For more information and to get the resources mentioned in this episode, visit digitalmarketer.com/podcast. Thank you for listening.